If you find your cat acting more disinterested than usual and not behaving quite as usual, chances are that your cat may be depressed. What are the warning signs? Whenever a cat stops exhibiting their usual behavioral patterns for an extended period of time, you need to consider whether their mental health could be suffering. Signs of depression in cats can include loss of apetite, weight loss, excessive sleep habbits and lack of grooming. Cats, just like humans, can have mood swings and these symptoms can also be caused by a host of physical ailments, so if your cat is showing any of these symptoms for more than a few days you should definitely take them to a vet. 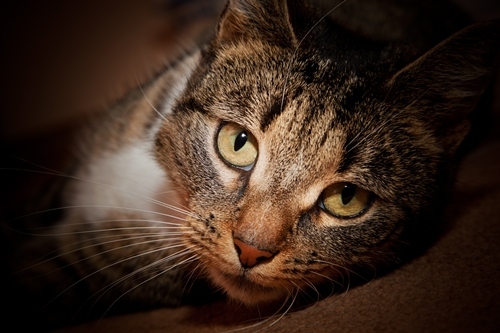 If no physical cause is found for their symptoms, chances are high that your cat could be depressed. In cats depression is most often caused by lack of attention or lack of entertainment, especially in solitary cats who are exclusively indoors. Get your cat some new toys and make sure to spend time playing with her every day, even if for only a few minutes. Sudden change in living arrangements can also wreak havoc on a cat’s mental state, especially if it’s a senior cat. Extra attention, cuddles and playing will go a long way in getting your cat on the road to recovery. * Always consult your veterinarian when your cat starts exhibiting behavior that is uncharacteristic of them.